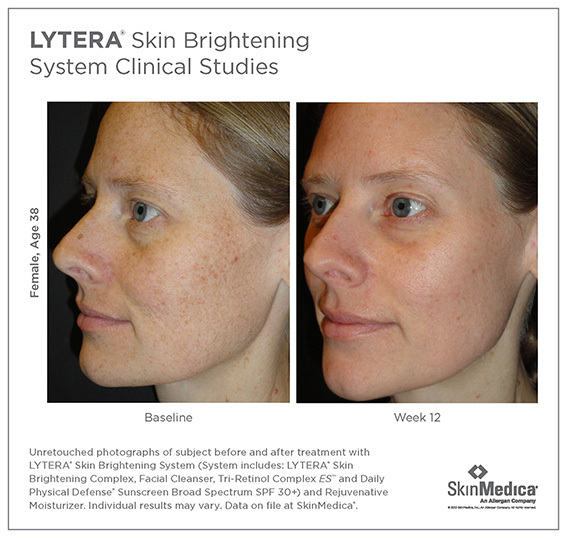 Hyperpigmentation is caused by sun damage, inflammation, or skin injuries. Hyperpigmentation can also be the result of hormones (birth control or pregnancy). This is called melasma, or the mask of pregnancy. People with darker skin types are more prone to hyperpigmentation that those with lighter skin, especially when there is excessive exposure to the sun. Many forms of hyperpigmentation are caused by an overproduction of melanin. Melanocytes are cells that produce melanin and they are found in the lower layer of the skin. Melanin is responsible for producing color in places such as the eyes, skin and hair. As the body ages, melanocyte regulation becomes less controlled by the body and begins to appear on the skin. UV light stimulates melanocyte activity, contributing to the reason why sun damage is the most common cause of hyperpigmentation in the skin. There are home skin care options for hyperpigmentation such as retinols, hydroxy acids and hydroquinone, which is a fading agent for the skin. Sunscreens are also essential to treating the cause of hyperpigmentation. Additional in-office procedures such as microdermabrasion, chemical peels and intense pulsed light laser treatments.